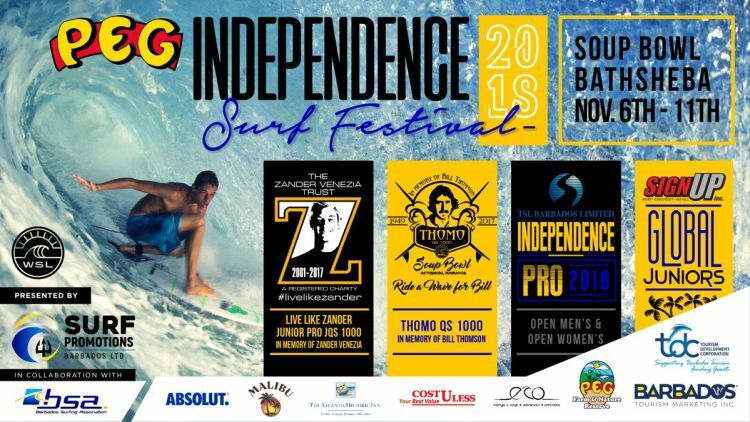 The Peg Independence Surf Festival 2018 is the biggest surfing event on the Barbados Surfing Association's Calendar. This year, Surf Promotions Barbados Limited has joined forces with the Barbados Surfing Association who is celebrating 35 of surfing contest in Barbados. - TSL Independence Pro - Open men’s, Open Women’s, and the Global Juniors under 16 and under 12 Juniors Division. This year’s festival will be attracting over 120 competitors from 10 countries and is part of the BOA Independence Invitational Games. Enjoy the PEG Lifestyle Village with Healthy Foods, Drinks and Ideas to a better fulfillment of the body mind and soul. Daily D.J. music will accompany the hot surfing energy with bikini body’s roaming around the beach. The evenings will set a different tone with party nights on Thursday, Friday, Saturday and Sunday. ECO Lifestyle & Lodge - Acoustics Jams and lots of eats and drinks. Sundowner Party with live entertainment. Crowning of the remaining Champions for the Live Like Zander JQS 1000 Boys and Girls, the TSL Independence Pro and the Global Juniors under 16 and under 12 Juniors.